The CSQ, a certification system founded by IMQ (Italian Institute for Seal of quality) and CESI stated on May 15th '96 that ELCA's quality system is in conformity with the requirements of the international Standard UNI EN ISO 9001. Certification of ELCA's Quality System n° CISQ/CSQ9115.ELC9, confirms once more that we are reliable suppliers able to plan and carry out a policy of continual improvement of our products and services offered both on national and international markets which are becoming more and more competitive and demanding. 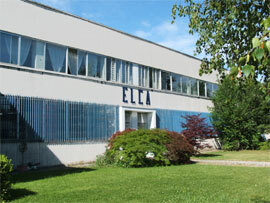 Born in 1962 to design and manufacture electrical and electronic equipment for industrial automation, ELCA has progressively concentrated its activity on current converters design and manufacture; in particular for plating, anodizing, aluminium electrocolouring and coating (cataphoanaphoresis). ELCA holds several European patents concerning pulse rectifiers used in anodizingand hardchromium plating equipped with proper process computers fully designed by ELCA itself.